Supporters of Mexican presidential candidate Andres Manuel Lopez Obrador took over toll booths in the latest protest over the official count. The campaigners, who are demanding a recount of all votes in the disputed 2 July poll, allowed motorists to enter the capital, Mexico City, for free. 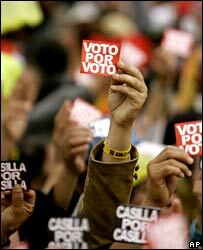 It comes a day after a spokesman for the leftist candidate warned that civil disobedience would intensify. Sit-ins by Mr Lopez Obrador's backers have paralysed Mexico City for a week. Official election results gave victory to conservative candidate Felipe Calderon by half a percentage point. Hundreds of Mr Lopez Obrador's supporters, carrying flags, gathered at the highway toll booths on Tuesday, waving motorists through for free. Mr Lopez Obrador told supporters on Monday that the protests were just the start of a long-term movement for institutional change. He spoke as thousands of demonstrators rallied outside the country's top electoral court. 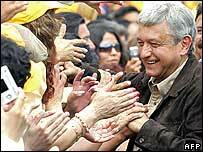 Mr Lopez Obrador has rejected the tribunal's decision to recount only 9% of votes. "The Mexican people do not want only part of the truth," he said. Results from the July election showed that Mr Lopez Obrador lost to Mr Calderon by less than 0.6 of a percentage point - or about 240,000 votes out of a total electorate of 41 million. UN and EU observers pronounced the election free and fair. But Mr Lopez Obrador gave some 900 pages of alleged evidence of electoral irregularities to the Federal Electoral Tribunal to press his calls for a full recount. But on Saturday the tribunal ruled that only the results from 11,839 polling stations - of a total of 130,500 - should be recounted, beginning on Wednesday. The tribunal has until 6 September to make its final ruling on the winner. Analysts say if widespread irregularities are discovered, the judges could order a more sweeping recount.